Emergency message on Rincon Middle School’s web page. Classes were cancelled Thursday at Rincon Middle School in Escondido out of “an abundance of caution” after an online shooting threat was reported against the school, district officials said. Escondido Police detectives began investigating the potential threat around 10 p.m. Wednesday but don’t believe it was credible, Lt. Ed Bennett said. But detectives were conducting a thorough investigation despite the vague online posting. 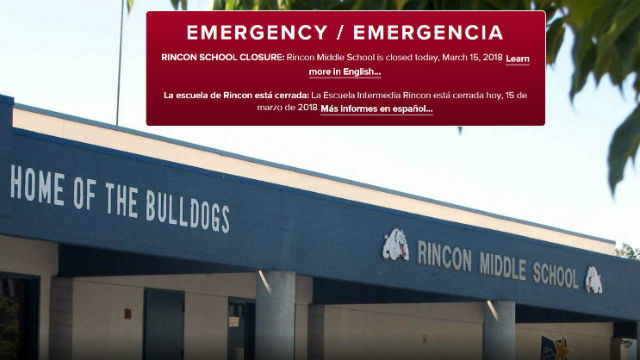 The message was posted on Rincon Middle School’s Facebook page in English and Spanish, where three Facebook users quickly thanked and commended the school for taking the precaution. No other campuses in Escondido would be affected Thursday, Bennett said. School resource officers will be at other nearby campuses as normal, and the police department will be fully staffed Thursday. Reported around 10 p.m. Wednesday, the message apparently first showed up on Instagram but was “vague and copied” from another social media site, Bennett said.